What are the basic characteristics of your firm’s partner compensation system (e.g., objective or subject, bonuses or no bonuses)? Is the system open (e.g., data and/or outcomes are known by all partners) or closed (e.g., data and/or results are confidential)? What is the overall satisfaction with your system (an estimate by the Managing Partner or COO responding to the survey)? 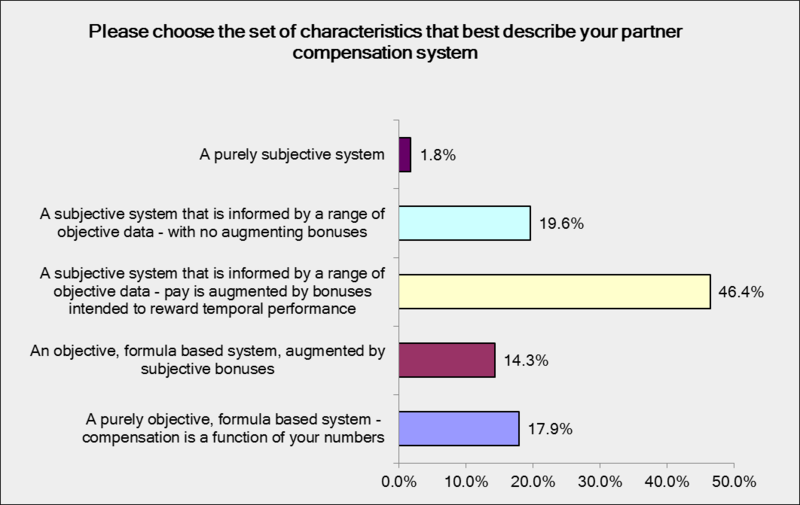 Relative to compensation system characteristics – subjective systems, informed by objective data are far and away the norm. Over two-thirds of respondents are using some form of subjective system (one of whom uses a purely subjective system). An overwhelming majority of partner compensation systems are fully open (84%). Conversely, only five percent are reportedly fully closed (i.e., data and outcomes are entirely confidential). So, who is most satisfied with their system? It would appear that purely objective systems lead to the highest levels of overall satisfaction. Further, it appears that adding a bonus component to the partner compensation system actually erodes overall satisfaction – very modestly in subjective systems informed by objective data, but substantially in objective/formula based systems. Note: Only one respondent had a purely subjective system – the sample size for that column is too small to draw any conclusions. Because so few respondents had closed systems, it is difficult to draw any conclusions regarding the impact data transparency has on overall satisfaction. Anecdotally, the fully closed systems and systems in which the outcomes are closed (i.e., everyone sees the performance data, but actual compensation numbers are confidential) appear to lead to higher levels of satisfaction. Take this table with a grain of salt given the small sample sizes for the closed and partially closed systems. A total of 56 Managing Partners, Firm Chairs, and/or COO/ Executive Directors completed the survey – not bad for a first survey by new firm. We ran tests for statistical significance, but the relatively small sample size in some categories limited our ability to get statistically determinant findings. We found out late in the process (after the reminder email was out) that the online survey here on the blog did not support some web browsers (73 firm leaders clicked through, we can only assume many had this technical limitation) – we implemented a work around, but very late in the process. Future question of the month surveys will provide an alternative site for those using web browsers not supported by our software. Given the overall value of this question, we intend to return to it again once we are routinely getting over 100 responses to surveys (inevitable over time). However, in the near term we will explore other strategy questions in the months ahead. If you have a suggestion or idea for a strategy question of the month, email us or share it in the comments section below. Thank you for your interest in law firm strategy topics. We will keep you posted regarding future content on the blog.